This commercial grade square picnic table features seating on all four sides, brining table conversation a little closer. Perforated table top and seats allows rain water to filter through ensuring that the surfaces dry up quickly after the rain. This picnic table provides seating for up to eight people. Umbrella ready with x-bracing and plenty of room under the table for an umbrella base. Stainless steel hardware included. 1-5/8" O.D. Steel Tube Frame. The state of the art finishing process used on the table top and seats combines the application of an 'Electrocoat Zinc Rich Primer' with a durable polyester powder-coat top layer to ensure every crevice and joint is completely sealed, providing full protection against	corrosion and weathering. 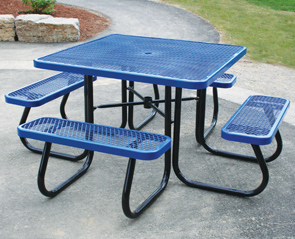 Table top and seats are finished in either a gloss or textured polyester powder-coat finish.